“I order this decor from Yakutsk,” shows Anna Galkina. 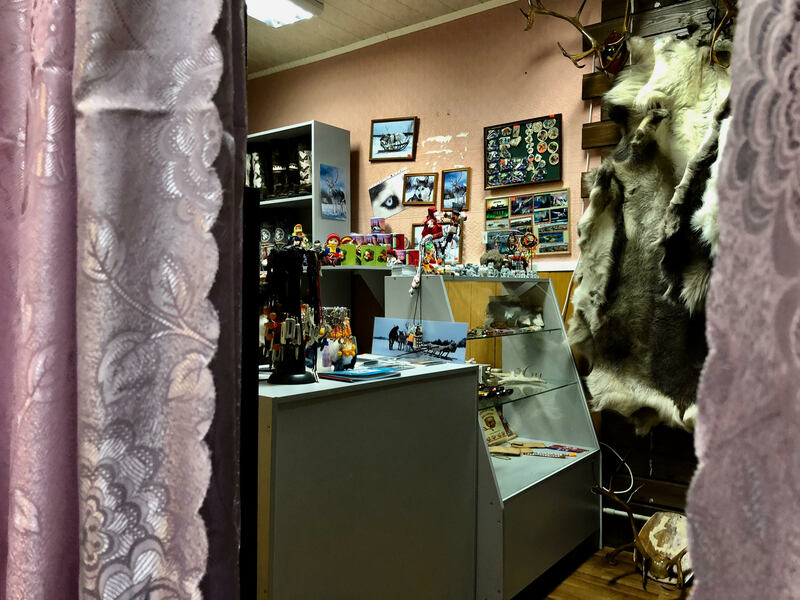 She walks to the shelves along the wall and picks up embroideries that embrace the reindeer skin boot at the top and go down at a tip in front. “As to the traditional embroideries of the local type, I make them myself”, she explains. Anna Galkina runs a shop and a workshop at the outskirts of Lujávre. Across the street there is dacha area and the river Virma runs close. Occactionally a car drives by or a dog is barking. It’s a quiet August day in the countryside. “We are three women who run the business together. I’m Sami and the other two are Komi,” she tells. It’s a small shop room with a table that serves as both a lunch table and a counter; three work seats side by side with projects, pieces of leather, beads and finished décor all over. 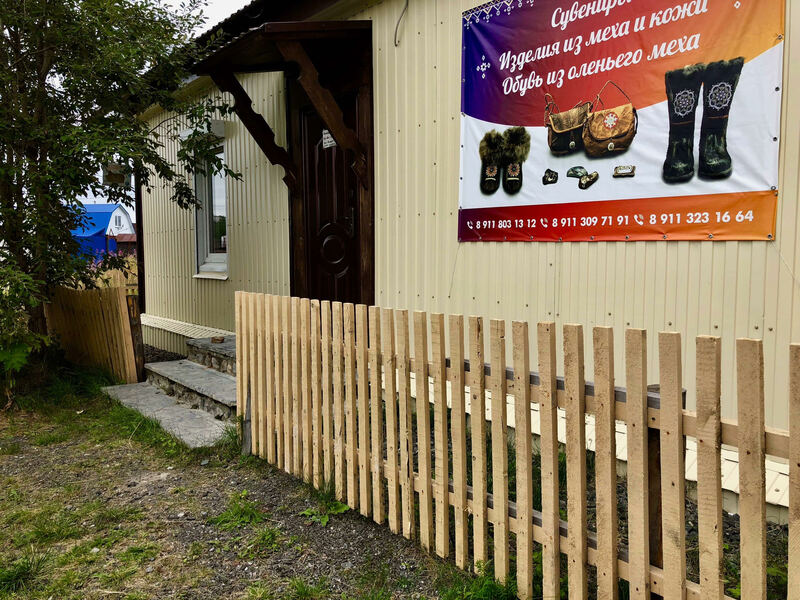 “Its so expensive to rent premises here,” explains Anna Gorkina, telling there’s another lady eager to work with them but the space sets limits. Anna tells she has “always” been doing duoddji, the Sami name for handicraft. Since the time she was small and learned from her mother and grandmother in the tundra. “Nevertheless, there is always something new to learn. I’m not a Mrs. Know-it-all. I like to learn and I like to see other people work, exchange experiences and discuss. There is always something interesting to catch up and I’m happy to exchange knowledge,” says Anna Galkina. Just as I arrive to Lujávri, Anna is going to leave the next morning. She is attending a meeting of Sami women in Norway and further visits a festival in Finland. Galkina tells that there is not so much activity in Lujávri, in Lovozero as it is called in Russian. The place has a hotel with a few rooms and a cafeteria open only until three o’clock p. m.
“Too few tourists come here. They say there are many Asian tourists coming to the area, but they are transferred straight off to one or another place some businessman is running. As a matter of fact, It’s only the Sami Summer Games that attract a lot of people. From time to time I travel around Russia to indigenous peoples’congresses or to popular festivals – things of this kind. If the trip is paid by those arranging the event,” she tells and summarizes many collaborative projects she previously has taken part in. For example in Tana, Vadsø and Helsinki. “Sometimes I think like: the rich do not need them, they drive everywhere anyway. And the poor need them, but do not have money,” Anna laughs a bit as she talks about her boots “Boorki” or “Pimi”, which are also well-known in East-Finnmark. She describes them as practical boots for everyone. “I wouldn’t say they are typical Sami boots because in that case they have a tip pointing up in the front. People say the boots are expensive, but take a look at the numbers,” she says, sitting down and writing on a piece of paper how much money is needed to pay for leather, for currying and for soles. The boots cost 15,000 to 17,000 rubles, or up to 2,200 Norwegian krones. It takes me up to one week to make a pair of boots,” she tells and shows the store part of premises. 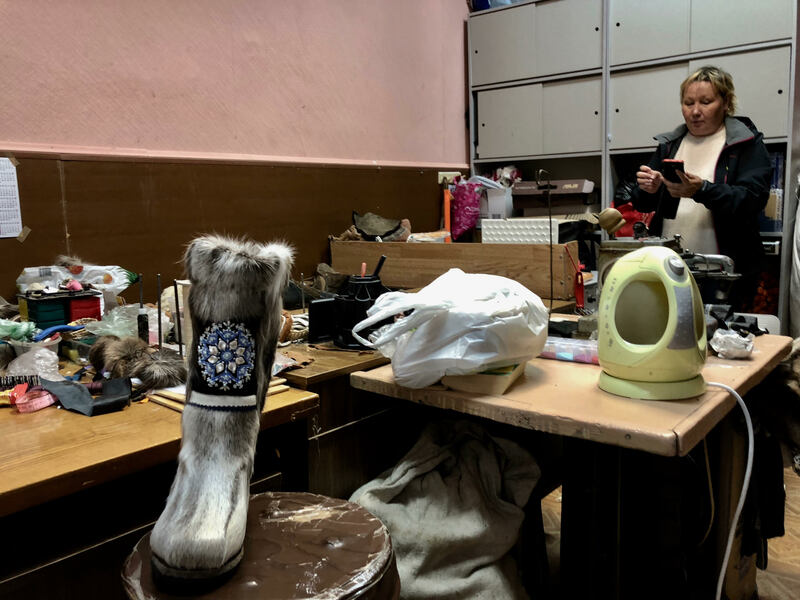 There are beautiful boots with local decor and decor from Yakutsk. There are typical souvenir items such as small dolls, postcards, leather and horn articles.